Home Shop Buy will match any authorized dealers price! If you find a lower price (including shipping, handling and delivery) on an identical item with the same features currently available for sale and delivery from an authorized dealer, contact us with the competitor's details in writing and we will match that total price. Please call us 1-866-306-0249 or e-mailcustomerservice@homeshopbuy.comand be prepared to provide our team with all the required information, including shipping, handling and delivery date. HSB reserves the right to require that a quote of a lower price from an authorized dealer be sent to us in writing. 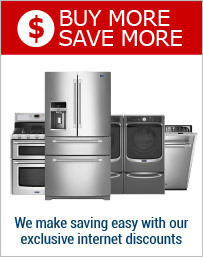 ♦ Clearance or closeout prices. In addition, HSB will not match competitor's prices that result from a price match. HSB's Price Match Guarantee does not apply to parts or accessories; HSB licensed partner websites or digital services. HSB price match guarantee will be in effect until your order is shipped. Once your order has shipped, we will not match a lower price. HSB reserves the right to revoke this policy at any time. Home Shop Buy (HSB) charges NO Sales Tax to orders shipped outside of California. Sales Tax is only applied to orders shipped within California and is determined by the county where the item is being shipped. Simply enter your Zip code in your Shopping Cart to see if your order qualifies for Sales Tax. FREE shipping on all orders of $299 or more, some restrictions may apply. Please enter your Zip Code in your shopping cart before checking out to see if your order qualifies for FREE shipping. If your order does not qualify for FREE shipping, then your shipping charges will be applied in the shopping cart. Shipping rates vary per product type and will be based on the shipping address.